Nice post. If you're right, there's an abrupt and major change in structural style as you go from south to north - any thoughts on why that might be? Thanks Chris. The lab lemming thought the strike slip faults might be transform faults, separating sections of the rifts on the southern end of the island that are moving at different rates. I tend to think that's not the case. If it were I'd expect there to be a lot of overlap in the direction of the maximum principal stress on the northern and southern parts of the island. If the stress state that drives the activity on the southern part of the island is fairly localized (and it looks to me like it is), then you don't have to move very far away from that part of the island to be in a new stress state with a different structural style. I think my views are like the ones you expressed on your blog (correct me if I'm wrong). 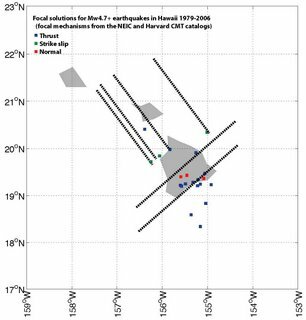 The stresses at the south end of the island are a local perturbation on a larger, regional stress field. 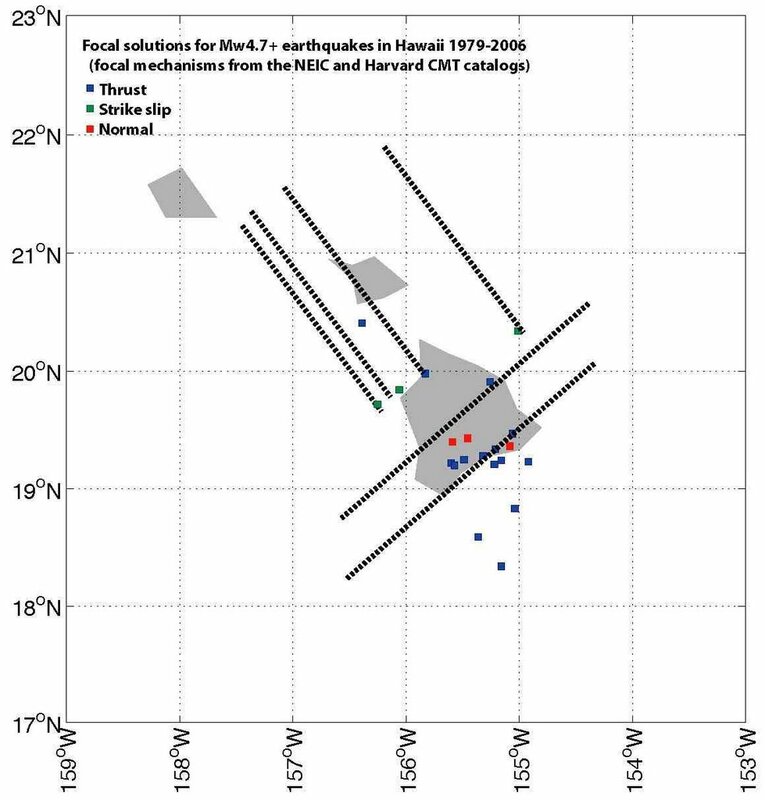 If that's correct I'd expect any earthquakes in the greater Hawaii area (if there were any) to have occurred on NW-SE striking faults. I'll search he NEIC catalog and see what I can find. The southern earthquakes are coming from an active volcanic rift- kilauea has been erupting continuously for decades. Why do you extent the faults beyond the Hawaii edifice and into/ past Maui? 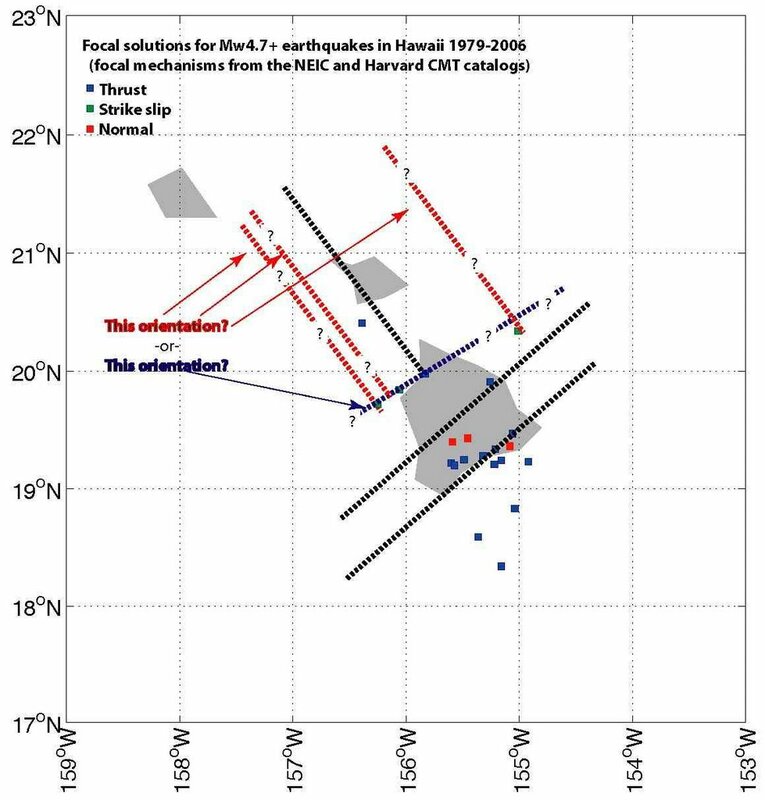 The faults extend to Maui because I created them by copying the blue line in the earlier figure and rotating it 90 degrees. In other words, I don't have a good reason. 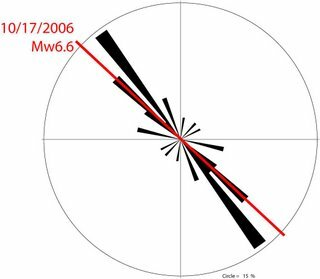 Volcanic magma and summit inflation are measurable and give fairly predictable outcomes and explanations for eruption events in Kilauea and Mauna Loa, the southernmost active volcanoes. But this is further north (Mauna Kea) and follows activity off of Laupahoehoe, which like this quake off of Puako is well above the southern region. 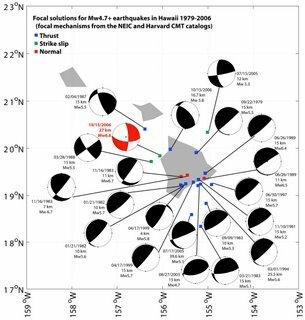 Hawaii is relatively stable in the middle of this huge mid-Pacific plate. Questions come to mind in light of the huge military build-up in Hawaii, including the construction of a star wars lazer refractor platform on Mauna Kea, suspended on 'huge earthquake-proof springs' according to a sergeant in the national guard assigned to the project. Then the possible impact from an underground Korean test and the depth of the quake ... any possible relationships??? Thanks for the comments. 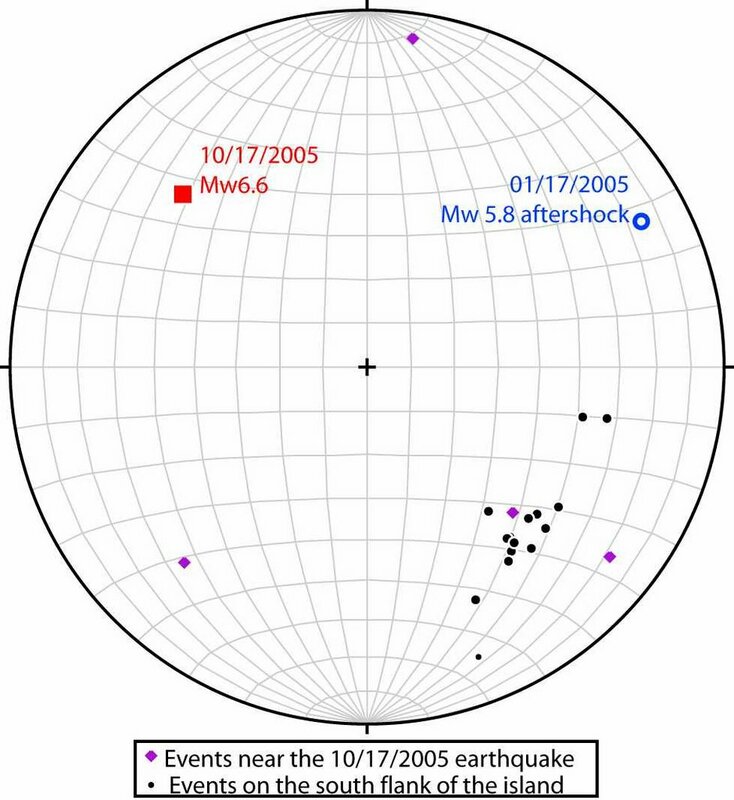 Are you asking if the Korean nuclear test could have triggered the Hawaiian quake? 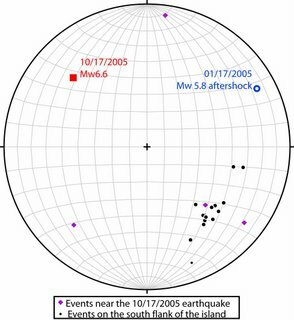 It's a cool thought but I'm doubtful since the Korean test was equivalent to an M 4.2 event, which is pretty small as far as earthquakes go. lorne, I'm very flattered. Thanks for the link.